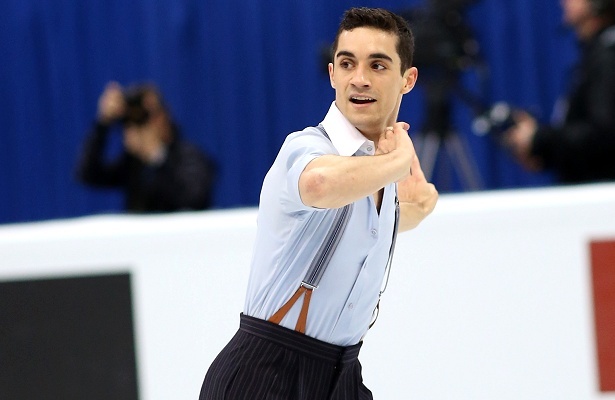 Javier Fernandez of Spain easily captured his fourth European title in Bratislava, Slovakia. Spain’s Javier Fernández easily took his fourth consecutive European title in Bratislava, Slovakia Thursday night. The World champion won with 60 points to spare ahead of Israel’s Alexei Bychenko and Maxim Kovtun of Russia. Bychenko won Israel’s first ever figure skating medal at the European Championships. Fernández touched down with his hand on his opening quadruple toeloop, but then nailed a beautiful quadruple Salchow-triple toeloop combination, triple Axel-double toe and another quad Salchow. He only crashed on the second triple Axel. The Spaniard sold his playful “Guys and Dolls” program well to the judges and audience, and picked up five perfect 10.0s for performance, choreography and interpretation. The now four-time European Champion earned 200.23 points and racked up 307.77 points total, becoming the second skater in history since Japan’s Yuzuru Hanyu to crack the 300-point barrier. The 24-year-old did not want the day to end and added that there was still work to do on the free skate. “We added the second triple Axel to the program and I thought it was really slow in the program, so I have to go back to training to make it more confident so I don’t make these mistakes in the next competition [at] Worlds,” he added. Bychenko turned in a solid program to “Les Miserables,” hitting a quadruple-single toeloop, a triple Axel, as well as six more triple jumps, but he went down on his second quad toe. Although he ranked fourth in the free as he did in the short, he was able to claim silver with 242.56 points. Kovtun skated next to last, which may have led to too much pressure for the Muscovite. He stepped out of the opening quad Salchow and then crashed badly on the quad toe. The Russian champion then popped the next jump, a planned quad Salchow, however, he was able to recover in the second half of the program to land a triple Axel-triple toe and three more triples. He slipped from second to third at 242.21 points. Florent Amodio delivered one of the most memorable moments of the competition and probably the Championship. The Frenchman had announced that he will retire from competition after Europeans and he just wanted to finish his career on a high note. He did exactly that, turning in a nearly perfect performance to “Memories of Sobral” that featured a quadruple Salchow and two triple Axels (240.96 points). At the end of his program, Amodio knelt down on the ice while the crowd was on their feet and cheered loudly. Coach Nikolai Morozov broke down in tears. Russia’s Mikhail Kolyada, 20, pulled up from ninth to fifth in his debut at the European championships with a strong performance (236.58 points). Ivan Righini of Italy finished sixth, his best result so far, with 236.36 points. Michal Březina of the Czech Republic dropped from third to tenth after an error-ridden program.